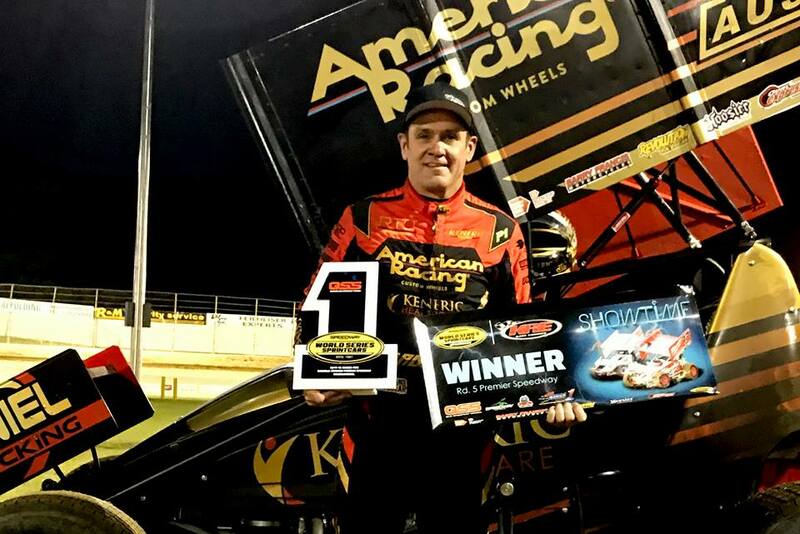 Kerry Madsen has pocketed a $40,000 paypacket for KRE Speedweek with a dominant win in round 5 at Warrnambool’s Premier Speedway. Starting outside Speedweek points leader James McFadden on the front row, Madsen only took one lap to take control of the race before Ryan Jones’ engine failed and left him stranded in turn four in the path of the leading pair. Madsen arrived first on the scene trying to avoid the #S63 as McFadden braked to avoid the melee only to stall and make enough contact with Madsen to push him into the rear of Jones. Madsen was able to keep his American Racing/Keneric Healthcare entry alive despite the shunt, however McFadden was sent to the rear of the field for coming to a complete stop, effectively foiling his chances of claiming the $10k Speedweek bonus. Dave Murcott retired on the next restart after front end contact with the turn 4 wall, while Carson Macedo also spun around with 29 laps to go, triggering another two stoppages where the same car lost a wheel cover and wore the consequences of bringing on the yellow lights and was sent to the rear of field for the stoppage. Cory Eliason made his first impact of the week with a swift move on Jamie Veal on the restart, before a front-end collapse on the NQ3 sent Steve Lines into a violent roll down the back straight. With just 6 laps remaining, Madsen was able to hold off the constant advances of Veal while Eliason defended his place from Darren Mollenoyux to claim third. McFadden clawed his way back to eighth, but it wasn’t enough to hold off the points haul of Madsen, who later admitted that James had the car to beat on the night. Jamie Veal was surprisingly unenthused by his first podium result of the week, disappointed that reverting to a chassis that he’d driven to five-straight feature wins at the tail of last season still wasn’t able to do everything he wanted to do to track Kerry down. “It’s disappointing but we’re heading in the right direction at least, so that’s something,” he said. Cory Eliason was a picture of relief claiming third, which justified the complaints he’d made earlier in the week that something wasn’t right with the car. The 16 contracted teams now head north to Brisbane’s Archerfield Speedway for round six of the QSS World Series on Wednesday night before taking on the two-night “Australian Sprintcar Open” on Friday and Saturday.